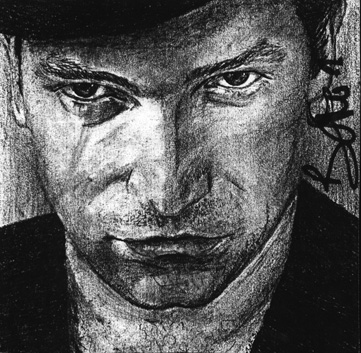 During art class we always listened to WBRU, Brown University radio, and on that day, March 16, 1992, the DJ announced that Bono had been spotted at the Four Seasons Hotel in Boston. I flipped out. I saw my chance and I grabbed hold and let destiny lead me. I asked everyone in the class if anyone would want to go with me. They all declined, but one friend informed that she knew a girl who went to Hopedale High who was from Dublin and worshipped U2. I took another chance, went to the payphone, and got her phone number from 411. Her name was Eryn*, though unfortunately her last name escapes me at this time. I rang her up and to my surprise she was home. I explained who I was and what I wanted to do. She was excited and said she couldn't believe that of all the days she could have stayed home from school, it would be this day. Fate was on my side. I called my mother and, since she understood, she dismissed me from school. I left right away, making sure that I had all my drawings in tow, and drove my 1984 Chrysler Laser (also dubbed U2 mobile, because of all the stickers) to Hopedale. We drove to the train station, as I didn't know Boston that well then, and made our way to the Four Seasons. Once there, we waited for hours, freezing, debating how long we should stay. 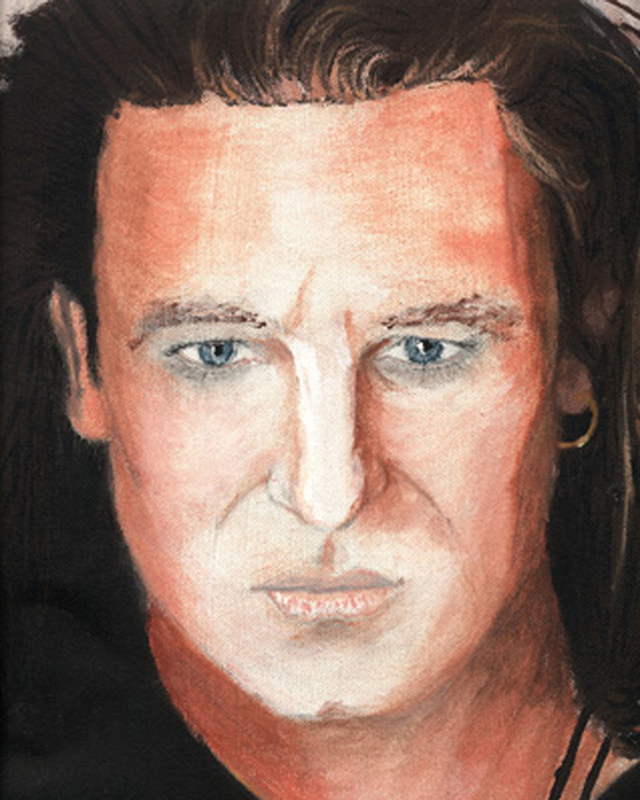 Then, as if in a dream, Eryn spotted him, Bono, mindlessly entering the front door. 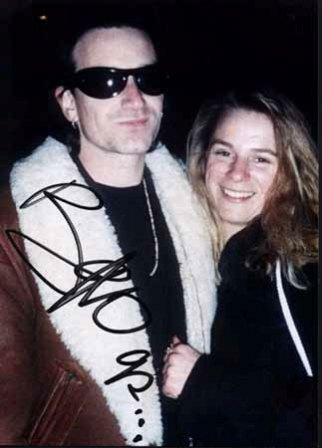 She called out to him in her husky, Irish accent, "Bono, would ya mind talking to us for a moment?" He turned suddenly and came towards us. When we had first arrived, we were the only two, but as we waited a small group of teen girls also joined. They started jumping up and down screaming. Eryn in all her Irish charm just started talking about Dublin and old times. As it were, she had hung out with them years ago when she was around 14, and to my surprise, he remembered her. I simply stood there, frozen, in awe. Finally, Eryn grabbed me and said, "Why don't cha ask him for a photo?" 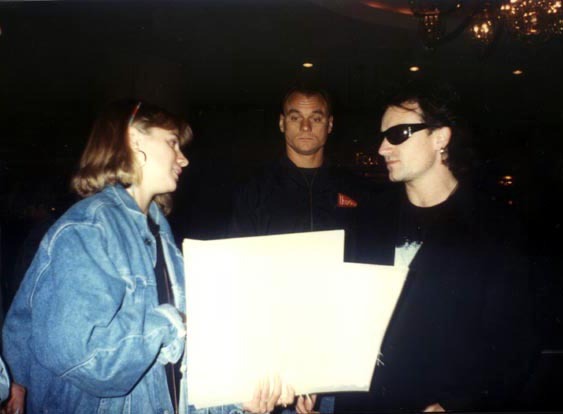 "Bono," I meekly asked, "Could I get a picture with you?" "Of course," he replied and pulled me close with his arm around my shoulder. Without hesitation, I slipped my arm around him. I was in heaven. I had a grin like I'd just won the lottery and if you look real close at the photo you can see his eyes rolling a little bit behind his dark shades. Having accomplished that, I gained the confidence to actually talk to him. "U2 is my favorite band. You've inspired me so much…"
I rambled on in fan talk. Eryn reminded me of the drawings, which I quickly shoved in his face. "Hold on," he extended his hand to me, "Bono." I took his hand and shook, "Melissa." "Let's see these drawings," he said and gracefully took the drawings and slowly looked at each one, "These are great, you're a really good artist." Now, I'm sure he was just being polite. I've since then given up on portraiture, but it was nice to hear these words from someone I admired so much. After signing autographs for all the others, he spun me around and, with my thick black marker, began writing on the back of my denim jacket. When he was finished he spun me around again, handed me my marker, and with a hand on each shoulder said, "Melissa, it was nice meeting you," turned, walked away and disappeared into the hotel. Everyone else there then grabbed at my jacket, "Oh, how cool!" I shook them off and ripped off my coat to find his self-portrait with, "Mr. B on my back," written underneath. I beamed. I understood. I felt enlightened. 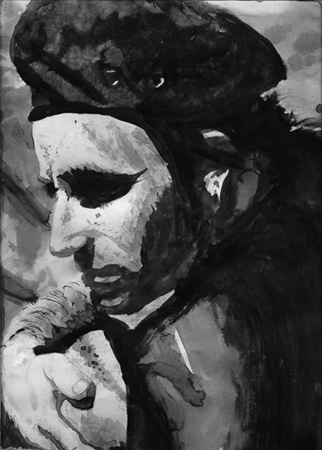 Bono was a REAL person, just like anyone else, just like me. And if you, if I, put my mind to it, I could accomplish anything. No longer would I suffer fools. No longer would I try to fit into a pre-existing stereotype simply to be accepted. I would stand my ground. Be myself. That was the key. Did I mention I was in British Vogue December 1992? A photocopy of a pencil drawing I ended up giving to him. The following day, March 17, 1992 St. Patrick's Day, I saw U2 at the Boston Garden with tickets from the band...Everywhere you went in the city that day all you could see was a sea of green and all you could hear was U2 blaring from every pub and car radio. It was magical for a U2 fan. 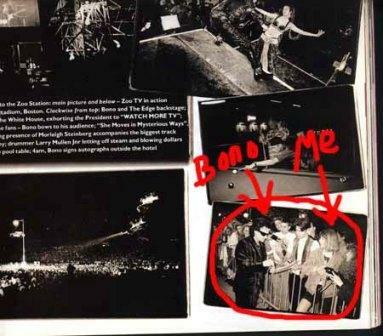 In the video of that show above, if you look really close, you can see me jumping up and down like a maniac in the first row of the stage right balcony as Bono takes the stage (0:31). Stalk me on twitter for the latest news on my upcoming book In the Now (in addition to my many inane ramblings because that's what twitter's for) @dreamoutloud or on Google+ or on Facebook or even on MySpace if you're wicked old school.